We just wrapped-up the second week of our internship program, and we have a great team in the making! 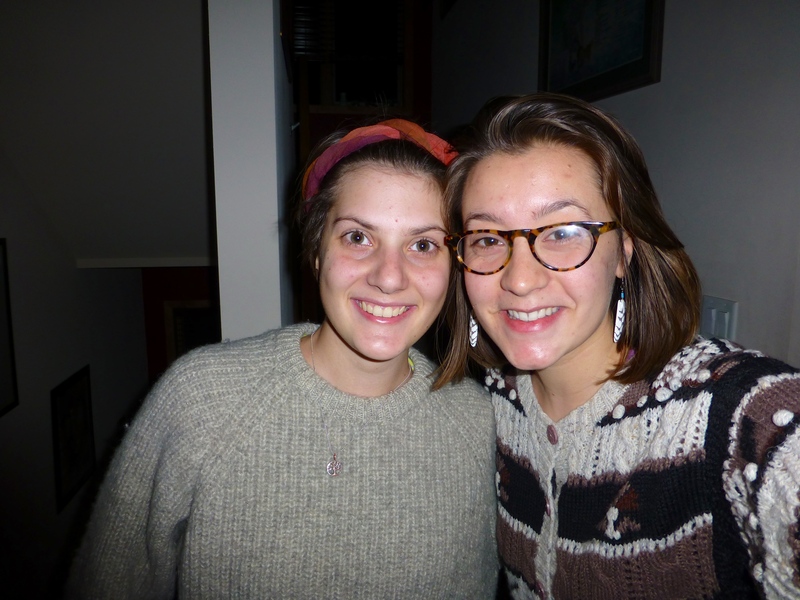 9 wonderful interns will be working with Growing Food and Sustainability this summer. Meet 3 of our new interns below! Hey I’m Sara and I was born and raised in the Cross Plains/Middleton area. I currently attend UW La Crosse and will be starting my senior year this fall. I’m majoring in community health with a minor in nutrition. In my free time I enjoy hiking, biking or swimming. I also love concerts, especially outdoor ones in the summer. My favorite place to visit in the summer is Minocqua, WI with family and relatives. I love my two dogs and when I’m not out doing activities I love napping 🙂 My goal for this summer is to have a better understanding of sustainable agriculture, mainly focusing on learning how to manage and run a vegetable/fruit garden that includes CSA boxes. I’m also interested in composting and keeping food local. 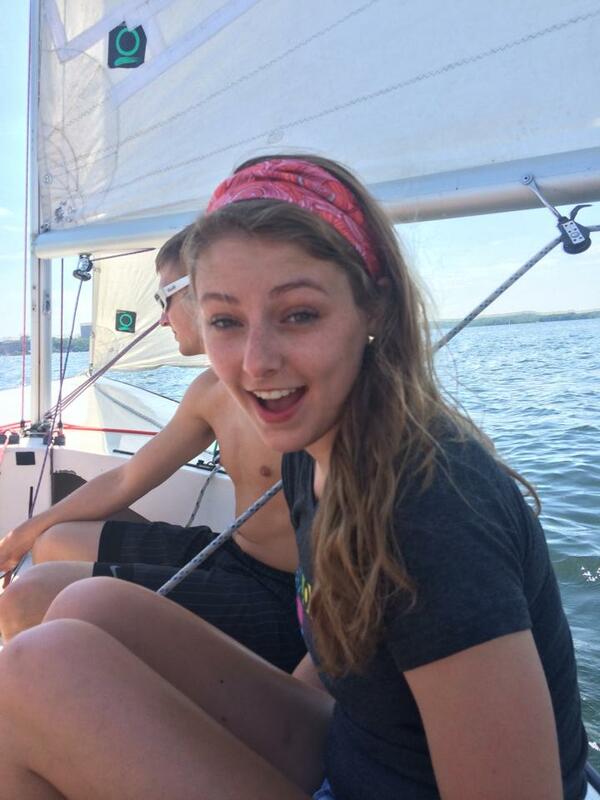 Sam is from Annandale, MN and she is about to start her senior year at UW-Madison studying zoology. In her free time she loves to read, hang out with friends, travel, and be outside. Her goals for this summer are to learn more about sustainable farming and to hopefully to get kids as excited about the environment as she is! Originally from the suburbs of Chicago, Michelle is now a third year student at UW-Madison. There, she explored a variety of her interests, including geology, astronomy, and religious studies, but ultimately, she pursued a more focused passion for environmental sciences. Michelle spends her free time walking down the lakeshore path, eating Babcock chocolate peanut butter ice cream on the Terrace, and playing with puppies. This summer, she hopes to learn how to grow a sustainable garden of her own while cultivating excitement within the community to work toward a healthier future. Our latest bout of rainy weather here in Wisconsin hasn’t kept us from moving steadily toward the sunny days of summer! The greenhouse is brimming with seedlings. 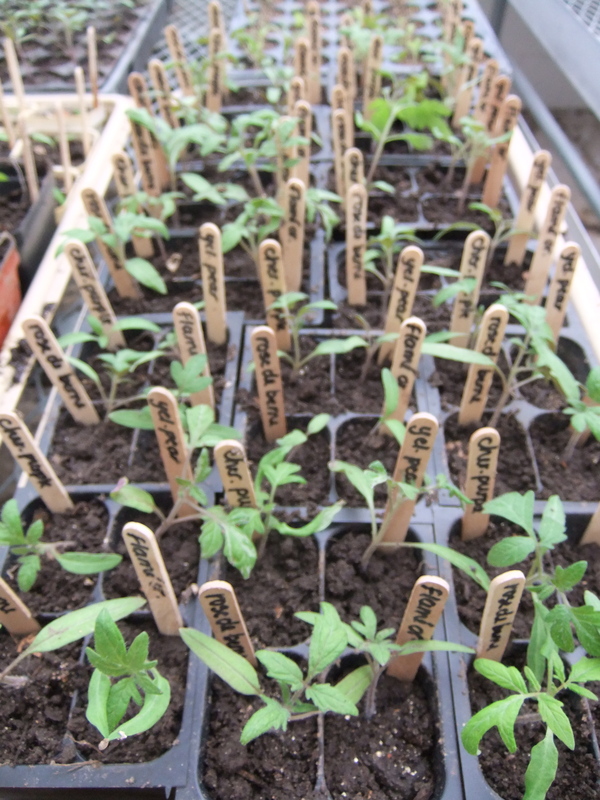 Our babies our growing up and in two weeks they will be ready for you to take home and plant in your own garden! Don’t forget to join us for our annual Spring Plant Sale on Saturday, May 17th from 9am-noon and Sunday, May 18th from 1-4pm (while supplies last!) This is an important fundraiser for us and a way to help you start your own vegetable garden! This year we’re offering 4-pack variety packs of tomatoes, in addition to eggplant, broccoli, basil, peppers, and more! We are still enrolling campers for our 3rd summer of Garden Camps! It’s not too late to sign-up to join us in the garden this summer. We’re in the process of adding a new outdoor kitchen and project area at the Youth Farm which promises to make this summer better than ever! Registration information can be found here. Our summer intern team is taking shape! We are in the midst of our final round of intern interviews. Five amazing new interns are already signed-on to work with us this summer. We’re so excited to welcome them to our team and to involve them in a transformative summer full of farming, education, and community building! Apply for a Youth Farm or Education Internship! Spring is in the air! Even though it feels spring is miles away, this month we have a made leaps and bounds in our summer planning. Our summer internship application is LIVE! This year we have TWO separate internships: youth farm interns and education interns. Youth Farm Interns will launch our NEW CSA, manage all farm maintenance and projects and run BIKE POWERED compost pick up and produce deliveries. Education Interns will DEVELOP curriculum for multiple age groups from ages 5 to 13, LEAD summer garden camp activities and ORGANIZE group bike rides to the Middleton Food Pantry. 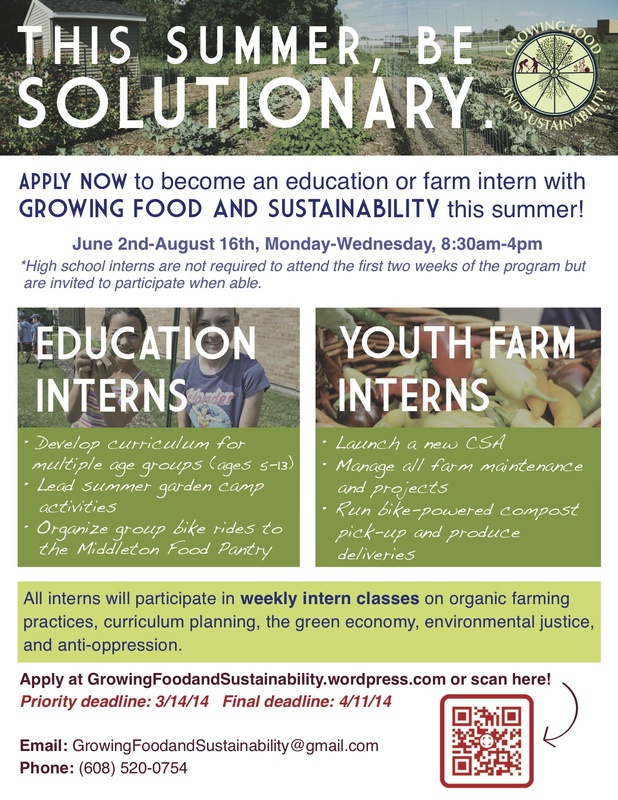 Also, all of our interns will PARTICIPATE in weekly INTERN CLASSES on organic farming practices, curriculum planning, the green economy, environmental justice and anti-oppression. If you are interested, check out the poster below to learn how to apply! We are looking for 12 young people (ages 14-30) to intern with our program this year. The internship commitment is 10 hours/week from April 1st-October 31st. Interns will work in one of our community or school gardens for 8 hours/week. Their time will be spent building and maintaining growing spaces, organizing community events, teaching gardening to children, and harvesting with our neighbors. For 2 hours/week the whole group will come together to participate in a workshop series on leadership development and environmental justice. Each intern will receive a $2,500 stipend for successful participation in the program. Some travel assistance is also available based on need. Last month, Robin, Gabrielle, and I (Program Leaders for Growing Food and Sustainability in Middleton, WI) attended the annual Grand Aspirations January Gathering in Roger’s Park, Chicago. (Though it tried, we did not let the polar vortex stop us.) Basically, January Gathering is a time for program leaders from all over the Midwest (Middleton, Milwaukee, Twin Cities, Highland Park-Detroit, Chicago, and Lexington) to come together to share skills and knowledge that help us run awesome programs, like green infrastructure projects, youth garden camps, and youth-run worker cooperatives. We also get to hang out and make revolutionary friends! Anthony (program leader for Lets Go Chicago) taught us how to make a gif at the No Talent Show. January Gathering grounds and energizes programs. January Gathering is a time to reflect and to look back over the year to search for success and evaluate failure in order to find solutions. To begin, it is important to look at the core values of Growing Food and Sustainability and Grand Aspirations: Justice, sustainability, prosperity, and community. Looking back at our core values, there were some that we were making progress toward, and others we had hoped to do better. Evaluating our progress allowed us to become grounded, to look forward and make important changes, such as improving our intern curriculum. To improve your program, you have to improve yourself. The gathering allows time to remember why we do it. When walking into a training session there is energy that fills your body. You feel hope and joy fill your soul. While in sessions you begin to grow as you self reflect. In Grand Aspirations energy and passion are recovered to make a change. You finally can feel one with yourself and a serene sense of freedom comes over you. When sessions are finished, you feel empowered and you begin to realize that it is not just about your program. It is about every program around the country and the amazing work we are doing as a whole. The work we do today will eventually change the world by solving the problems, one garden, one solution at a time. One garden may seem too small to have an impact, but when we all come together and work towards the same goal, something much greater is born. Leverage existing institutional resource flows to grow the green economy. Or in other words, we need to focus on creating new, sustainable systems that meet needs within our community. It’s all about the ripple effect. If you don’t have the ripple effect, it’s not enough. Anti-oppression needs to be central to every part of our work. Every time we make a big decision or build a new project, we need to have anti-oppression at the center of our conversation. Growing food with kids is sweet and cute, but the work we are doing is also “deadly serious”. The systems we’re trying to change are huge and intimidating (the industrial food system), but are also very intimate (the food I can grow for my neighbors). Since we’ve been back, we’ve had some great discussions reflecting on the history of our program and where we are going from here. We’re all itching for spring and are eager to put our plans into action! Look how excited we are to get to work! 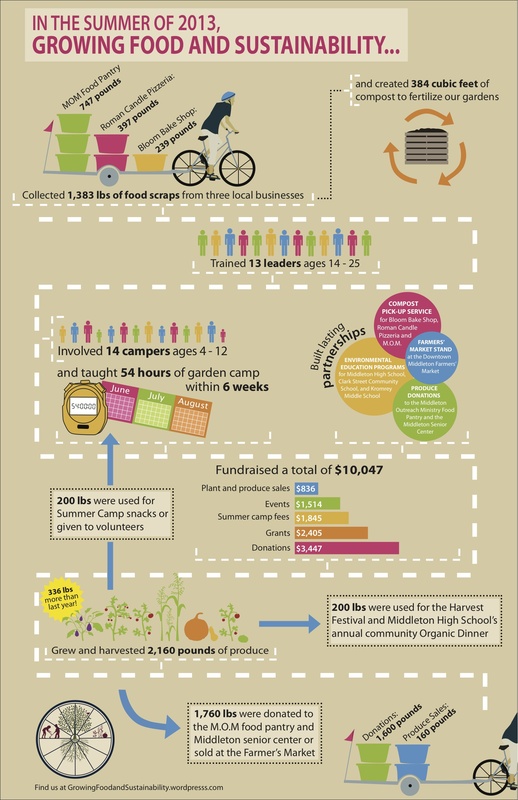 Check out Growing Food and Sustainability’s (Middleton, WI) snazzy new infographic featuring our accomplishments for the 2013 season! Ring in the New Year! January Gatherings Got Me Pumped! A quick note from the National Gatherings Team — we wanted to let you all know how excited we are about the programming that this January Gathering is boasting, and we wanted to bring you into the know. As always, our January Gathering is being modulated to meet the growth needs of our many teams, team members and regionalities! Our three gatherings, Oakland, Chicago, and D.C., will each have specifically designed curricula to explore old and new topics — we will continue developing our anti-oppression programming, our trainings on how to train, our budgeting and fundraising sessions and our personal development sessions. THE NEW AND EXCITING SESSIONS ARE: a totally revised and revamped media training that will more intentionally link media to local needs AND a session on fractal leadership model development. There is room for more sessions, too, so if you have something to suggest, let us know! Anthony from the Agenda Committee can take your comment or question at anthony.betori@gmail.com. 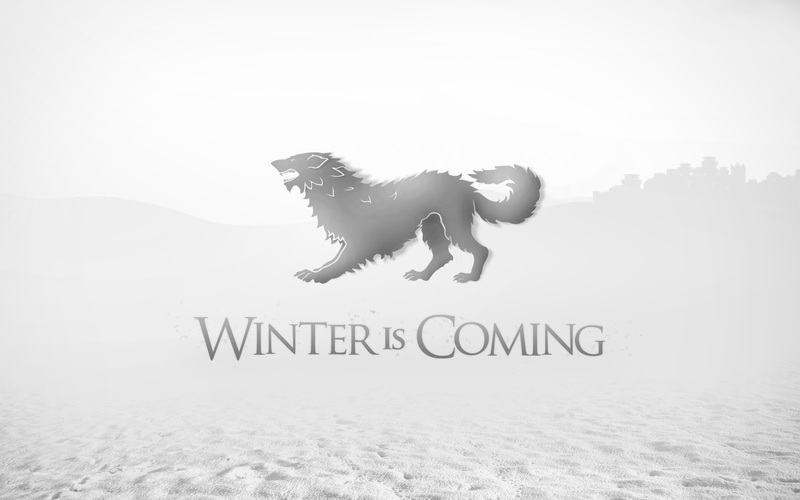 The food is going to be good // the connections are going to grow our network stronger // the snow in each city will be beautiful // the possibilities are growing! We can’t wait to see you, new teams and old! The second best time of the year is here — January Gathering is coming!